A number of readers (one is always heartened to discover they exist!) have written in to ask about the ongoing state of this blog, which has admittedly declined in frequency as of late. I am still here, I assure you, but there are several things at work here: 1.) I’ve shifted most of the micro-announcement, interesting-links sort material to Twitter (follow here); my column at Slate.com, meanwhile, covers some of the longer-form material that may otherwise have been treated here. 2.) I’ve had a large number of magazine and other journalistic assignments, some having nothing at all to do with driving or transport, and in the economy of words, paying work must always trump non-paying (and trust me, if this blog was a paying gig there’d be no problem filling it seven days a week with material). And, 3.) I’ve been traveling a lot, for work and for pleasure. 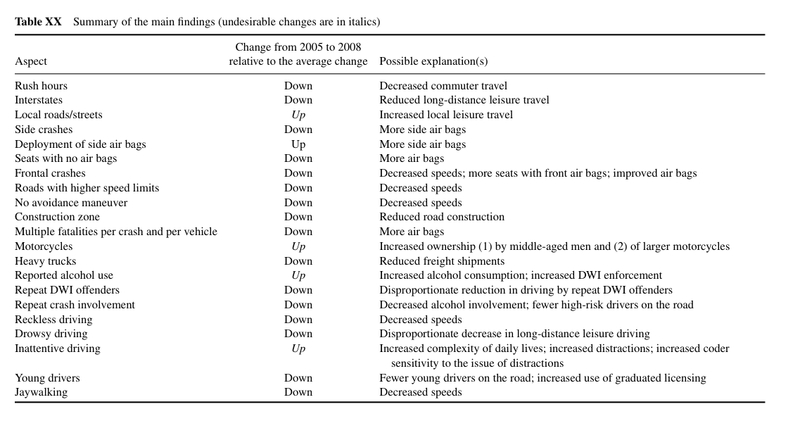 From 1994 to 2005, U.S. road fatalities increased by 7 percent, from 40,716 to 43,510. However, from 2005 to 2009, they dropped by 22 percent, to 33,963 in 2009 (see Figure 1). A reduction of such magnitude over such a short time has not occurred since road safety statistics were first kept (starting in 1913), except for the reductions during World War II (National Safety Council 2009). He essentially finds the decline is greater than might be expected were we simply to factor in the state of the economy over the past few years, and the chart below summarizes where injuries have gone up and where they have gone down in a number of significant categories. There’s other intriguing details — like the decline in repeat DWI crashes, or the downtick in station-wagon crashes — but I’ll leave those for you to sift through. Comments Off on Traffic Advisory. Click here to leave a comment.